Currently, William Hill is the reigning number 1 betting app in Android operating systems. It rates an overall 4.8 stars out of 5 stars. A wide array of sports and non-sports events is present in the app for gambling and betting. 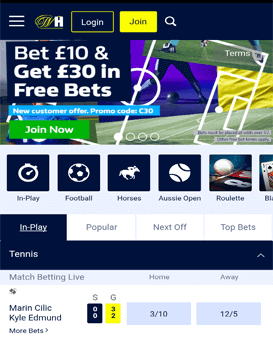 Despite having mobile websites for William Hill, the smartphone app fits perfectly well with smartphones which brings a more user-friendly interface. The image you see above is one of the first things you see right after the app title flashes. You have to turn your location on so that the app can verify if gambling in your current area is legal and licensed. The image above shows you the home page where it is pretty much straightforward with a clean and minimalist design. In here, you can see several quick links to William Hill’s most popular sports like horse racing, football, tennis, and even cricket. In a separate tab, you can find several casino-related games. The image above shows you the contents when you press the sidebar at the upper left; where you can view your profile up top (when completely registered). Various sport betting events can see as the sidebar collapsed. Commonly, all apps for Android devices can either be downloaded for free or purchased at Google Store primarily. There are also third-party app stores that also serve the same purpose, but you have to tweak your Android device’s settings for this. However Google Play, up until this day, does not support any app that involves real-time gambling. There is no available update for this matter but do not worry, William Hill manages and lets you download their Android app for free off from their website. If you are familiar with the specific steps you take when installing from third-party servers or stores, you can directly head to William Hill Online. But if you are a bit unfamiliar or new to the situation, follow these easy steps. Step 1: First of all, access William Hill on your android device’s web browser and press download. If a warning suddenly pops up simply press okay. The app is not harmful to your device. Step 2: If your phone has modified settings, you may skip some steps and directly install the app. If not, here are ways to modify your settings (refer to center photo). First, head to your settings and click Security. Next, look for the section Device Administration and locate Unknown Sources. Lastly, depending on which Android OS your device is running on (refer to right photo), you can click the check box or click the slide bar; both options means allowing your phone to install apps not from Google Play. After which you can safely install the app. Step 3: To finally install the app on your Android device, look for the .apk file either in your file manager or on your download folder. Just click on the .apk file, and it should install right away. After following all the steps above, your app should be working right now. Most often there has not been any complaints of app malfunctions upon installation. Always remember to turn your location on afterwards to verify if gambling and betting are allowed in your current country. Apple’s iOS is one of the widely used OS in smartphones and smart devices. It guaranteed that William Hill is available on iOS as well. Like its Android counterpart, among all the betting apps available for iOS or Apple devices, William Hill reigns number 1. It offers a wide array of sports and non-sports betting events. The photo above shows the home page which bears no difference in purpose and functionality like the Android version even though the interface is different. You can easily access the most popular sports betting events like horse racing, cricket, and football. The colour scheme for the app is the same for both operating systems which offers a clean and minimalistic feel. The second photo shows the payment section. That is where you “put” your money in for betting. The interface is pretty much straightforward and straightforward which avoids getting all customers confused. By just filling in the needed details asked in the payment section, you can directly bet afterwards. The photo above shows you the contact page for iOS devices. Here, you can ask their 24/7 customer service for any concerns or questions. The first box offers the FAQs section and the second box is live chat support. In the FAQs section, you can find common questions about the app and their answers for them. On the other hand, the live chat system allows you to directly communicate to the service crew in the case that you need help. William Hill in iOS is available in iStore. It is readily available for any of your Apple devices for free. However, Apple requires you to be at least 17 years old before downloading the game. To download and install William Hill on your Apple devices, simply follow these easy steps. Step 1: First, locate and click the iStore on your device. Step 2: Type William Hill in the search tab and click enter. Step 3: After which simply click install and your app is good to go. It can see that Apple does allow gambling apps on their store. Because of this, installing and downloading William Hill on your device is automatically done compared to Android’s manual download and manual installation. Either way, both method works perfectly fine. Since the advent of smartphones, websites have specifically made mobile versions of their desktop websites you access on your computers or laptops. Mobile version looks different compared to their desktop website cousins. The interface is designed to fit mobile gadgets better. If you have noticed, some desktop websites that do not have any mobile versions of their site end up becoming hard to navigate and the texts appear too small wherein you have to zoom in. Gladly, William Hill has a mobile version of its desktop website. Right off the bat, from the photo provided above, you can quickly compare it to the mobile app. Technically, mobile website versions look very different from the mobile app. It is solely because the mobile website is not an app. The mobile version has more animations, swiping sideways gesture, and even some flashing photos on the background. That is because the mobile website is utilising tools perfect for your browser which suit your phone. Compared to mobile apps, they do not take up any of your device storage, and there is no downloading or installing process required. All you have to do is enter the website, and you’re good to go. As far as design is concerned, the mobile version looks better and a bit more elegant. It has better animations and has a lot more colour. On the other hand, the app provides more convenience when it comes to accessing it. You do not have to open your web browser and type in the mobile website. All you have to do is click, and you’re. In mobile sites, some browser may save your password and some may not. If your browser is not set to save passwords, it can be a bit frustrating and a bit time always consuming to type in your details every time you access the mobile site. So, If you wish better visual experience, you can opt for the mobile website version. But if you want simplicity and accessibility, the mobile app may suit you better. Either way, both versions of William Hill will serve you with the best online mobile gambling experience. William Hill also offers separate apps that are focused on a single theme. For instance, one of them is William Hill Bingo. Although William Hill is well known for all its sports betting and other non-sport gambling like casinos and lotteries, they have also invested time and effort in a dedicated bingo site. There are tons of games available both in the app and the mobile website as shown below. Let alone, and they offer a lot of enticing promotions and big bonuses. For Newcomers, William Hill Bingo, gives you a 400% bonus up to £40. It divided into two where £30 go to Bingo Bonus and £10 Games Bonus which allows you to explore and play with app altogether. This bonus is only applicable once and if you spend £10. After spending the desired minimum amount of £10, the app offers you a more considerable bonus. For your first eight days, you can explore and get-to-know the app for free! Yes for free, which means you can play any bingo games for free wherein you can win a jackpot of £3,200. Sign up now and get your awesome bonus packages. Another separate app that gives you Vegas gambling on a screen is the William Hill Vegas Casino App. This Vegas casino app is the most famous and most notable out there. It has ratings of a large 8.64 stars out of 10. It welcomes players with a high definition of animation and ambience. Currently, there are a ton of games you can gamble on the app and is still growing to launch more exclusive titles. Even well-loved table games like Blackjack, Texas Hold ‘em, 3-Card Poker, and many more are available in the game. Some features might come in both in 3D or 2D options. In Addition, the app even sports live versions of some table games. This feature includes real-time betting, interactive chat system, and even wide bet ranges. Out of all Vegas casino apps, William Hill’s app offers the most realistic and most interactive casino gambling in the mobile world. However, due to differences in rules and regulations, William Hill might not be available to some areas in Asia, United States, and some countries in Europe. William Hill would not The Home of Betting without its amazing bonus offers. Upon registration, like the Bingo App, your minimum bet of £10 will become £40 immediately. In addition, you get 10 free spins in the Pig Wizards game. You can also play like you’re in a casino even if you’re lounging in your PJs. All you have to do is sign up and play with William Hill Mobile Casino. You can access this fun activity in the casino tab in the William Hill mobile website. It offers over 20 languages to celebrate the diversity of its players internationally. However, like the Vegas Casino App, not all countries worldwide can play due to some restrictions in their rules and regulations. A lot of virtual casino games offered at the mobile casino. Few of which are several slot games, table games, and even video poker. Also, the mobile casino also offers live betting with real-time play and interactive chat system. William Hill Mobile Casino has a lot of 24/7 gambling rooms where you can join in. This A mobile casino doesn’t come short in bonuses as well. Newcomers can have their bets grow to up to £300. One of the features they have added to the app is #YourOdds. With this, you can tweet from your Twitter account with the #YourOdds or message them through the app directly; this helps you select on the odds you want to bet on, and they can price it up for you. Football betting is available both on the mobile website and mobile app. You can easily see this on both their home pages. You can click on the by day tab to see the full list of games available on that day. Out of all the football betting mobile apps out there, this is the easiest one to use. Horse racing betting is not limited to desktop websites only, but they have reached the mobile platform as well. Like football betting, you can see this on both their home pages. By clicking hot picks, you can immediately see the top 10 bets for the day. However, live streaming of horse racing betting looks better on tablet devices compared to smartphones. Out of all the features, cash out has been deemed the most important. Players can now cash their bets out and have a chance to gain smaller amounts of winnings than letting all your bet run. When you play with William Hill Mobile, you will surely feel welcomed. For new gamblers or users in the app, your minimum bet of £10 (win or lose) can get you an additional £30! Another offer you can acquire is called 2 Clear Bonus. Under this bonus, you will get a 15% free bet bonus atop your winnings which can have a maximum amount of £100. To acquire this bonus your house must win at least 2 or more lengths. Check our special review about each William Hill promo code where you can find the latest offers for Sport, Casino and other sections of the site. Like any other app in the mobile platform, system requirements should be met before having a successful installation. Also, if your device is incompatible with the app then you cannot download and install the app on your device. To ensure a successful download and installation of the app, since this is only available on the website and not in Google Play, your device should operate at least in Android 4.1.2 or known as Android Jellybean. Upon downloading the .apk file, it has a total of approximately 4 MB. Upon installation, the app occupies about 60.4 MB of your storage. Make sure to have ample space for app storage and memory consumption of the app which has an average of 1.7 MB. Most importantly, make sure that your country allows you to have online gambling otherwise do not attempt to install the app. For Apple products, your operating system should be at least iOS 9.0. It occupies 64 MB of your storage; so make sure to have enough space for the app. A newly updated William Hill App Version 8.0 is currently available. However, iOS requires its players to be at least 17 years old to download the game for free. Unlike the Android app, if your country does not allow mobile gambling, you cannot download the app nor view the app in the iStore. William Hill is compatible with iPhones, iPads, and iWatches. In William Hill, you can expect easy and fast transactions. Payment methods can range from debit cards and credit card to eWallets and bank transfers. Below are the following payment methods together with their minimum and maximum deposits and withdrawals. You can deposit a minimum of 10 and a maximum of 99,000. No extra fees charged and it offers instant processing. You can withdraw your winning with a minimum of 5 and a maximum of 20,000. No extra fees are charged and expect 1-3 days of the payment process. You can deposit a minimum of 10 and a maximum of 99,000. No extra fees charged, and it offers instant processing. You can withdraw your winning with a minimum of 5 and a maximum of 20,000. No extra fees are charged and expect 1-3 days of the payment process. You can deposit a minimum of 10 and a maximum of 30,000. No extra fees are charged, and it offers instant processing. You can withdraw your winning with a minimum of 10 and a maximum of 37,500. No extra fees are charged and expect 1-4 hours of the payment process. You can deposit a minimum of 10 and a maximum of 80,000. No extra fees charged and it offers instant processing. You can withdraw your winning with a minimum of 5 and a maximum of 25,000. No extra fees are charged and expect 24 hours of the payment process. You can deposit a minimum of 10 and a maximum of 5,500. No extra fees charged, and it offers instant processing. You can withdraw your winning with a minimum of 10 and a maximum of 5,500. No extra fees are charged and expect 24 hours of the payment process. You can deposit a minimum of 10 and a maximum of 10,000. No extra fees charged, and it offers instant processing. No withdrawal processing is available. You can deposit a minimum of 10 and a maximum of 200. No extra fees charged, and it offers instant processing. No withdrawal processing is available. You can deposit a minimum of 10 and a maximum of 750. No extra fees charged and it offers instant processing. You can withdraw your winning with a minimum of 10 and a maximum of 2,000. No extra fees are charged and expect 24 hours of the payment process. You can deposit a minimum of 10 and a maximum of 100,000. No extra fees are charged, and it offers instant processing. You can withdraw your winning with a minimum of 25 and a maximum of 100,000. No extra fees are charged and expect 2-10 banking days of the payment process. You can deposit a minimum of 10 and a maximum of 50,000. No extra fees charged, and it offers instant processing. You can withdraw your winning with a minimum of 100 and a maximum of 50,000. No extra fees are charged and expect 5-28 banking days of the payment process. William Hill founded in 1934. Now, it has over 2,400 licensed betting offices that have a wide array of sports and non-sports gambling, gaming machines, and number-based services like lotteries. William Hill does not only offer traditional ways of gambling, but they are into online gambling as well. With the advent of technology, even gambling and bookmaking has made its way into our smartphones and other smart gadgets. Betting, Gambling and bookmaking have been internationally accepted in several countries as a legal form of entertainment. Guaranteed that you join gambling corporations that are legal in your country, you will not have any trouble. One of the best and biggest betting and bookmaking companies in the world is William Hill. William Hill, The Home of Betting, is the very first betting company that is made legal and licensed in Nevada and the United States. They have been operating legally in the United States market since 2012. Here are some of the most common FAQs you can find regarding the mobile app version of William Hill. Together with those questions are the best answers you can see; here are some of them. What is my Account Page for? Your account page contains messages you’ve received and sent, your bets and bonuses, and details and settings. In your details and setting, you can update your profile and tweak your preferences. Also, your Account Page allows you to have transactions for depositing your bets, withdrawing your winnings, transfer and reverse funds, and even adding more payment methods. Is my country allowed to use the app? Unfortunately, there are more countries that are restricted than allowed. Some of the restricted countries are United States, Cambodia, Malaysia, Brazil, Africa, China, and many more. Countries that are allowed to use the app are Italy, Spain, Latvia, Ukraine, Australia, Germany, Macau, and Macedonia. Make sure to create your account on the corresponding website for your country. To join, first of all, you should download and install the app or visit the mobile version. After which, simply click Join and fill in all the needed information and you are good to go. Verifying your account is needed so the company can check if you are above 18 years old and that you are truthfully stating and declaring the information you typed in during registration. That is under the strict regulations of the Gambling Commission. Also, to avoid being suspended, please verify your account with 72 hours upon registration. What do I need to get verified? There are documents you need to provide to get verified. It is recommended to acquire all these documents before you register to lessen hassle and keep your registration process smooth-sailing. To verify your age, you need to provide one of the following: passport, driving license, National ID card, or birth certificate. To verify your identity, you need to provide: signed credit agreement, utility bill (less than six months old), and a bank statement (less than six months old). I have all the documents, what do I do with these? If you have obtained everything, all you need to do is send them. The quickest way would be to verify it online. Simply take a photo of the documents you have within the crop frame of the app. The app can’t verify me, what do I do?” icon=”faq2″]If you are having a hard time verifying yourself with the app, you can send it via email (ageverification@willhill.com). Make sure to attach the needed documents as a scanned document or photo, or as a photo attachment. William Hill Online is Europe’s leading and best online gambling company in existence. This grants customers and interested people to indulge in the William Hill experience of gambling. This business venture of online gambling from William Hill can operate through online (mobile website), smartphone app, and even telephone and text services. Last 2013, the company has successfully spread its business in Australia. Also, William Hill listed in the FTSE 500 in the London Stock Exchange. Mobile betting has first been brought to light in the early ’90s but was hugely famous around 2007 and 2008. Due to big fans of bookmakers and gambling both from Europe and the United States, by the year 2013, it has gained popularity again. About 20% of all online bets made from smartphone apps and such amount will triple by the year 2020. Overall, William Hill Mobile offers a one of a kind experience. It offers fast and easy deposit options and hassle-free withdrawal process. The app has been named the best mobile gambling app for both Android and iOS platforms; from the minimalistic features of the app to the extensive 3D options of some of its special apps. The mobile website for William Hill offers an elegant ambience and interface with its seamless animations. Despite being unavailable in a lot of countries due to strict adherence to rules and regulations, William Hill has dominated the mobile gambling app by growing each year to become better than they already are. The company refuses to settle in what they are used to, which helps them expand and learn to bring the best experience to all its players. Customer reviews show that people switch their old gambling apps to William Hill. It deserves a 9.5 over 10 rating.